China.org recently reported that China’s economic stimulus created 22 million jobs over the past two years. 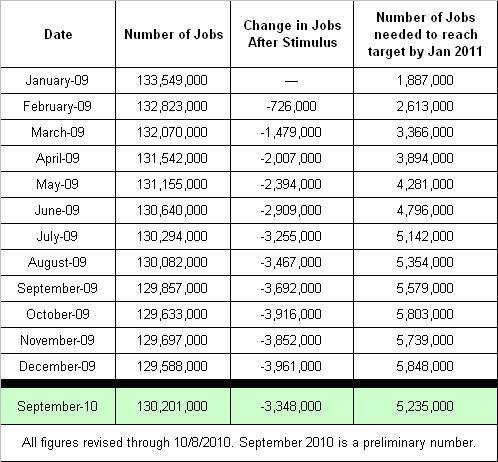 During same time frame, the Obama Administration’s economic stimulus plan lost 3.3 million jobs. The Chinese government’s two-year stimulus package cost an estimated $595.4 billion, while the Obama Administration squandered an estimated $887 billion. What China got right, and what the Obama Administration did wrong. First, the Chinese government put the focus on jobs growth, with a goal of reaching full employment. The Obama Administration simply sought to create 3.5 million jobs, which is pathetic considering that 15 million Americans are unemployed. Second, China focused on helping businesses retain jobs by allowing them to defer social insurance payments. The Obama Administration focused on demonizing businesses, while allowing a social security tax credit directly to what they referred to as the “middle class”. The “Make Work Pay” credit amounted to an annual subsidy of $400 per year ($30 per month, or $1.50 per day) for the average working person. The Obama Administration also implemented an Economic Recovery Credit of $250 per year, which was paid directly to retired persons. Out of the $887 billion squandered on Obama’s stimulus plan; only around 13% ($116 billion) was allocated between these programs. Although one might be able to live off of $1.00 to $1.50 per day in China, it doesn’t work like that in America. On top of this, if jobs growth were the goal, it would have made more sense to stimulate employers, rather than workers and retired persons. Third, the Chinese government cut the rate of social insurance contributions and provided certain social insurance subsidies for businesses. The Obama Administration, after doing virtually nothing to help businesses for all of 2009, finally woke up. After having lost 3.9 million jobs by the end of 2009 (link), the Administration finally pushed for the “Hire Act”, but not until February of 2010. Although the “Hire Act” allows a tax credit for the employer’s portion of social security taxes on new employees, the catch is that businesses have to hire new employees who can demonstrate that they have been unemployed for at least 60 days. Unfortunately, the Obama Administration has failed, to this day, to do anything to help employers retain their existing workforce. The Obama Administration has failed by doing too little, too late. In addition to creating 22 millions jobs, the Chinese government claims to have helped 1.6 million businesses, and to have saved 60 million jobs. The Obama Administration’s stimulus plan was supposed to save 1,613,000 jobs in addition to creating 1,887,000 jobs, but since it actually resulted in the loss of 3,348,000 jobs, it will now take the creation of 5,235,000 jobs, by January of 2011, to reach the original target (reference). Who creates jobs in America? When job creation is the goal, whom should an economic stimulus target? How much longer will the American people stand for an arrogant and incompetent government?